Learn how to use Coconut Flour, Almond Flour and Cassava Flour in your favorite baked goods. Have you ever made a paleo bread, cake or cookie and, well, it just kinda did not work? You know how it feels to look at $20 worth of ingredients and think, please tell me I am NOT going to have to throw this down the drain. I remember when I first started the Paleo diet and started baking. It WAS NOT Easy. There is just nothing like baking with paleo flours and it was a doozy trying to figure out how I could use it and not have everything taste weird. Also, just try substituting coconut flour for almond flour and see how that turns out. No Shame here, I am the queen of Paleo Baking. When I wrote my print cookbook Paleo Eats, I created 26 paleo desserts and over 12 breads for the book. I know my way around paleo flours and how to make recipes that no one will believe are Paleo. I’m super blessed to know how and when to use Paleo flours in recipes to make easy, baked goods that taste like the REAL DEAL. That’s why I’m so excited to share Paleo Baking 101 Class I share my best tips and tricks to making baked good on the Paleo diet. Cooking with Coconut flour, almond flour and Cassava Flour. You also get a 14 page guide filled with more tips and tricks for each flour with my personal recipes formulas to making Paleo Baked Goods. In addition to the course and guide, I'm including a special bonus. 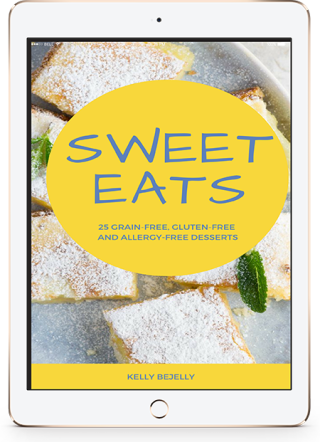 My ebook Sweet Eats ($19.99) which is filled with delicious healthy Paleo desserts. Kelly Bejelly is the recipe developer, writer and photographer behind the popular grain-free food blog, Agirlworthsaving.net. She is the author of the cookbook, Paleo Eats: 101 Comforting Gluten-Free, Grain-Free and Dairy-Free Recipes for the Foodie in You. After being diagnosed as pre-diabetic in 2009, in a last ditch effort to save herself, she tried the Paleo diet. Within six months, she lost 65 lbs, normalized her blood sugars and ended her battle with mental anxiety and depression. Her cooking style focuses on "Paleo Cooking from Heart". You know what I'm talking about. . . The soft chocolate chip cookies you shared with your mom hot out of the oven. The sweet and sour meatballs that you got every time you visited your favorite Chinese restaurant. The key lime pie your grandmother made every time she visited. She lives in Portland, Oregon with her husband and her two sons.